It's hard to believe it's already time to look at the Turner Classic Movies schedule for October -- especially with this coming weekend's Southern California forecast in the triple digits! 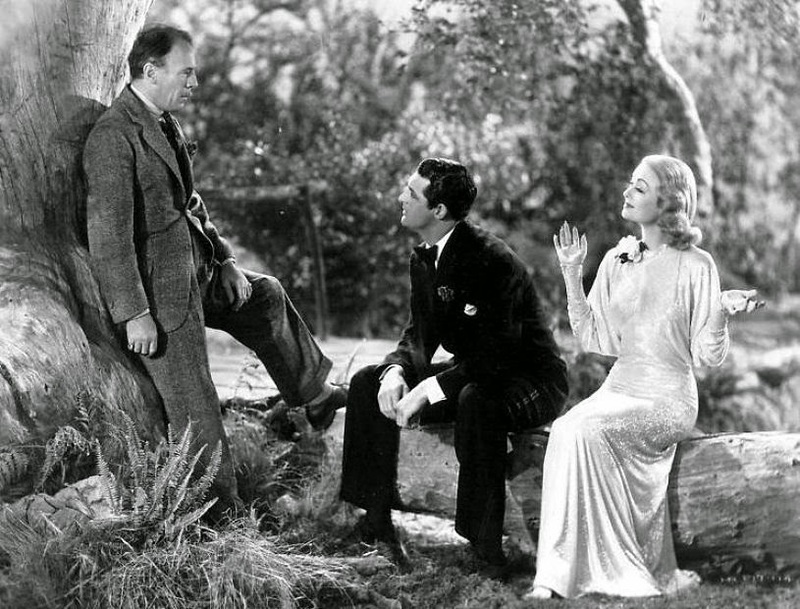 ...The first evening of ghost films on Thursday, October 2nd, is titled "Unfinished Business" and leads off with the classic TOPPER (1937) with Cary Grant and Constance Bennett. The schedule also includes THE CANTERVILLE GHOST (1944), a terrific family film with Margaret O'Brien, Charles Laughton, and Robert Young, as well as BEYOND TOMORROW (1940) with Richard Carlson and Jean Parker. I'm especially interested in checking out A PLACE OF ONE'S OWN (1945) with two great British stars, Margaret Lockwood and James Mason. ...OUR VINES HAVE TENDER GRAPES (1945) is classic MGM Americana airing on Friday, October 3rd. 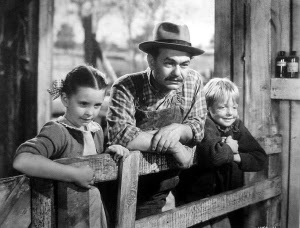 Edward G. Robinson and Agnes Moorehead play Norwegian-American farmers raising Margaret O'Brien. The wonderful supporting cast includes James Craig, Frances Gifford, Dorothy Morris, and Jackie "Butch" Jenkins, plus marvelous character actors like Arthur Space and Louis Jean Heydt. ...The Friday Night Spotlight series for October focuses on Africa. The series kicks off on the evening of the 3rd with a slate including THE AFRICAN QUEEN (1951), CASABLANCA (1942), and THE WIND AND THE LION (1975). ...I love train movies, and there's a whole evening of them on October 4th, starting with Carole Lombard and John Barrymore in TWENTIETH CENTURY (1935). That's followed by Hitchcock's THE LADY VANISHES (1938) and WITHOUT RESERVATIONS (1946). ...October 5th starts off with one of my all-time favorite British films, GREEN FOR DANGER (1946), an engaging wartime mystery which has stood up to repeat viewings. Alastair Sim is the inspector on the case at a British hospital in the country. 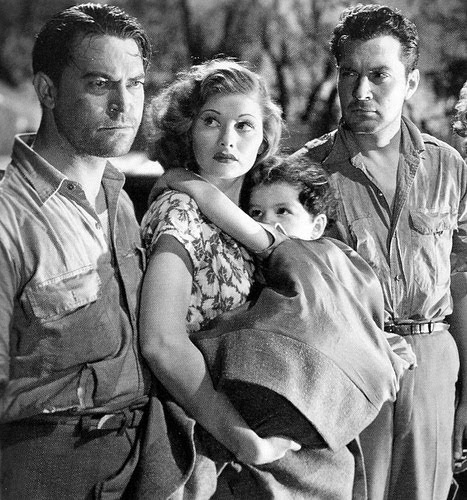 ...I recently reviewed the great "B" movie FIVE CAME BACK (1939), which finds Chester Morris, Lucille Ball, Kent Taylor, and Wendy Barrie, among others, stranded in the jungle with very nasty natives. Don't miss it on October 5th. ...I saw Carole Lombard and Fred MacMurray in SWING HIGH, SWING LOW (1937) at UCLA a couple of years ago. This interesting comedy-drama, directed by Mitchell Leisen, will air as part of a tribute to Carole Lombard on October 6th. ...A lineup of movies directed by Jack Webb on October 8th includes a film I've never seen, THE LAST TIME I SAW ARCHIE (1961) with Robert Mitchum and Martha Hyer. 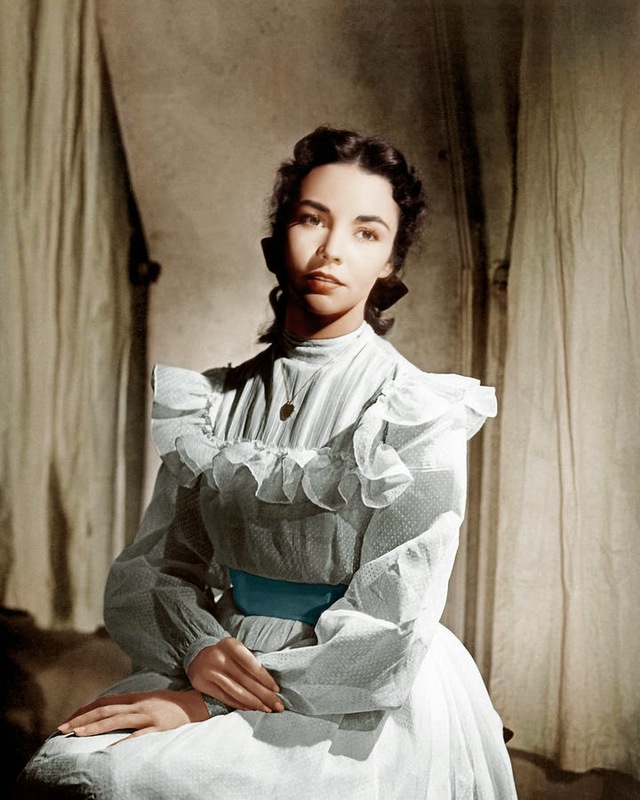 ...October 9th an evening of "Supernatural Romance" starts with the lovely fantasy PORTRAIT OF JENNIE (1948) with Joseph Cotten and Jennifer Jones, followed by another wonderful film, THE GHOST AND MRS. MUIR (1947) with Gene Tierney and Rex Harrison. ....October 10th TCM shows ONE NIGHT AT SUSIE'S (1930) with Billie Dove and Douglas Fairbanks Jr., which was just released by the Warner Archive. ...October 10th also includes a lineup of films starring Sally Blane, who was born Elizabeth Jane Young and was the older sister of Loretta Young. Only on TCM! Titles include TANNED LEGS ((1929) and THE SILVER STREAK (1935). This is a day my DVR will be running all day scooping up obscure titles for later exploration! 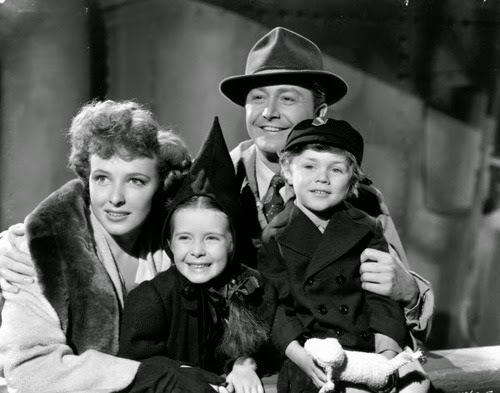 ...An October 13th birthday tribute to Laraine Day includes one of her Westerns with George O'Brien, PAINTED DESERT (1938), and the very fine WWII drama JOURNEY FOR MARGARET (1942) with Robert Young and Margaret O'Brien. ...There's a tribute to Richard Dix on October 14th. 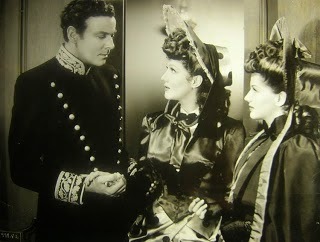 I'll be recording several Dix films including THE ARIZONIAN (1935) with Margot Grahame and Preston Foster. 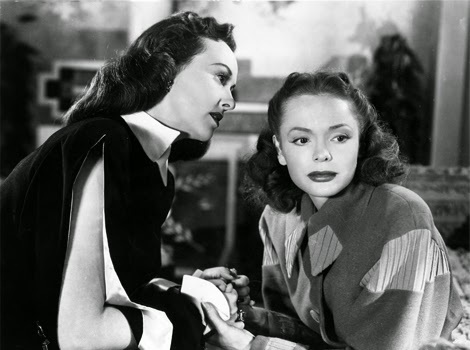 ...I'm also looking forward to SILVER SKATES (1943) on the 14th, starring the skater Belita (THE HUNTED) and Patricia Morison, who turns 100 in March! ...A great day on October 14th concludes with a prime time tribute to Franchot Tone, including THE UNGUARDED HOUR (1936) with Loretta Young and his Oscar-nominated role in MUTINY ON THE BOUNTY (1935). ...MAN WANTED (1932) is a really fun pre-Code starring Kay Francis, airing on October 15th. Kay plays a married workaholic magazine editor who falls for her secretary (David Manners). 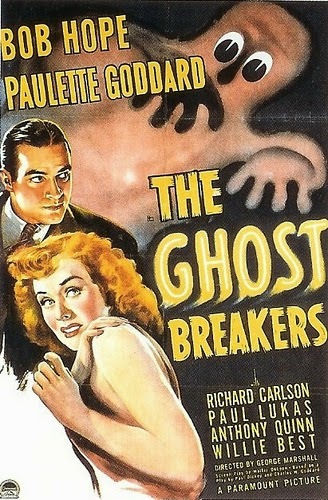 ..."Ghost Comedies" on October 16th include Bob Hope and Paulette Goddard in the classic spooky old house film THE GHOST BREAKERS (1940). ...THE MACOMBER AFFAIR (1947) is still not out on DVD, but it's on TCM October 17th. It stars Gregory Peck, Joan Bennett, and Robert Preston in a tale of a possible murder on a safari. ...My friend Blake Lucas recently recommended Fritz Lang's MOONFLEET (1955), starring Stewart Granger and George Sanders, at the blog Rupert Pupkin Speaks. MOONFLEET airs on October 18th. ...There's a morning of pre-Codes on October 20th. I'm interested in seeing FRAMED (1930) with Regis Toomey and Evelyn Brent. It's fun seeing Toomey, who became such a great character actor, in his early leading man roles. ...October 21st will feature a tribute to director Edgar G. Ulmer, leading off with HER SISTER'S SECRET (1946), a most enjoyable film starring Nancy Coleman and Margaret Lindsay which was screened at this year's TCM Classic Film Festival. It will also be screened at the 2015 UCLA Festival of Preservation. 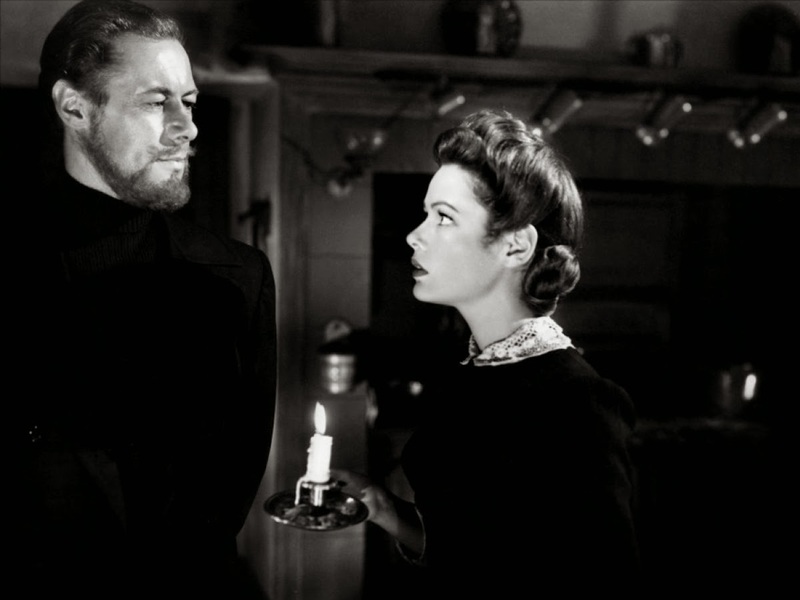 ..."Gothic Ghosts" on October 23rd include what many think is the best ghost movie of them all, THE UNINVITED (1944), starring Ray Milland and Gail Russell. The evening also features Eleanor Parker and Alexis Smith in THE WOMAN IN WHITE (1948), based on the novel by Wilkie Collins. 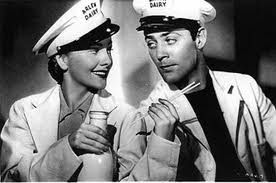 ...The delightful musical comedy IRENE (1940) airs on October 26th, starring Ray Milland, Anna Neagle, Roland Young, Billie Burke, and Marsha Hunt. 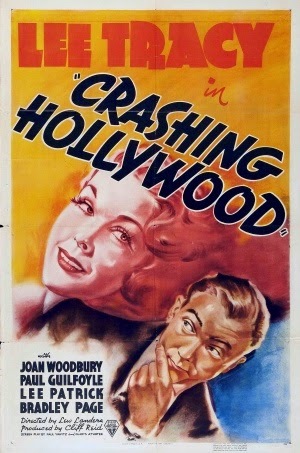 ...I really enjoyed the "B" film CRASHING HOLLYWOOD (1938), with Lee Tracy as an aspiring screenwriter. Rib-tickling fun directed by Lew Landers. It's on October 27th. 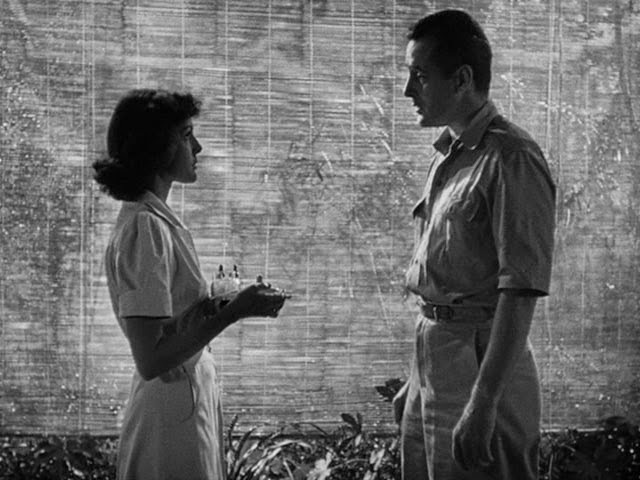 ...I'm looking forward to recording Tom Conway and Audrey Long, who just passed away, in A NIGHT OF ADVENTURE (1944) on October 30th. ...The month of ghost movies wraps up on the night of October 30th with a "Haunted Houses" theme, including the William Castle film 13 GHOSTS (1960). ...There's an entire day of spooky movies on Halloween, including the Val Lewton classic I WALKED WITH A ZOMBIE (1943), starring Tom Conway and Frances Dee, directed by Jacques Tourneur. For more on TCM in October, check out the complete schedule. Happy Autumn and Happy Halloween! 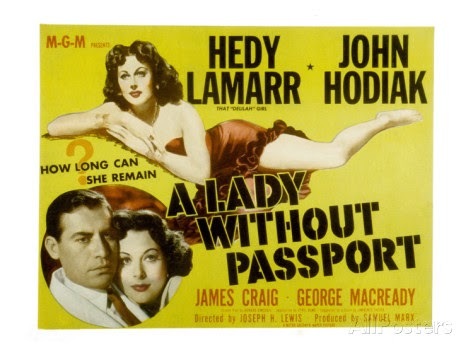 MGM'S A LADY WITHOUT PASSPORT (1950) is a story of international intrigue set in pre-Castro Cuba. It's available on DVD from the Warner Archive. 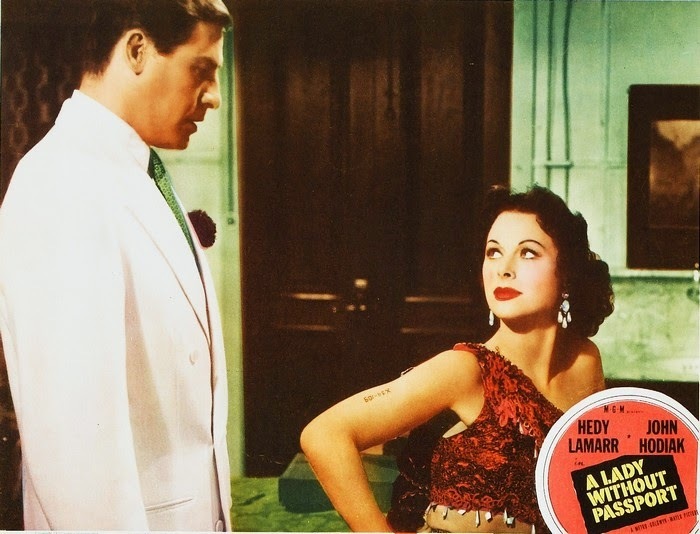 A murder in New York sends INS agent Pete Karczag (John Hodiak) undercover in Cuba, where he poses as a Hungarian immigrant anxious for papers to enter the United States. Just as Pete hopes, a smuggler named Palinov (George Macready) offers to get Pete into the U.S. -- for a price. Also anxious to get into the U.S. is Marianne Lorress (Hedy Lamarr), a Buchenwald survivor. 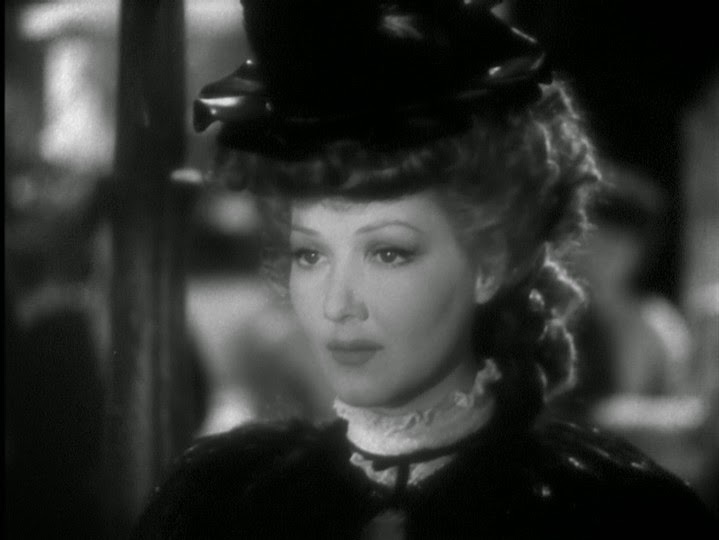 (Beautiful Hedy looks somewhat tired in this film, but it fits her character's background.) All bets are off when Palinov learns Pete's true identity. A LADY WITHOUT PASSPORT was directed by Joseph H. Lewis, and the setting of the final confrontation in a foggy Florida swamp seems to be right out of the climax of his previous film, GUN CRAZY (1950). 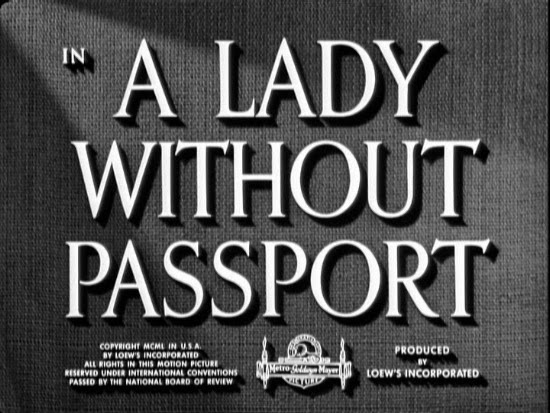 A LADY WITHOUT PASSPORT, however, suffers from a tepid, murky plot which never goes much of anywhere, and it doesn't help the film that Hodiak spends much of it with a Hungarian accent. I usually enjoy Hodiak, Lamarr, and James Craig, who plays Hodiak's boss, but this one just doesn't gel. Even the most exciting sequence, when the INS chases a plane full of illegal immigrants, is diminished by too-obvious miniature work. Perhaps the most interesting aspect of the film is that the overall plotline, focusing on illegal immigration, is so undated. On the other hand, illegal immigrants from all over the world using Havana as a way station before entering the U.S. is a story that could only be of that era! The supporting cast includes Steven Geray (who I increasingly find really annoying), Bruce Cowling, Nedrick Young, Robert Osterloh, Trevor Bardette, and Charles Wagenheim. The dancer in a Cuban club, Nita Bieber, was also a dancer in that year's very enjoyable MGM musical SUMMER STOCK (1950). The movie was filmed in black and white by Paul Vogel. The DVD is a good print, and the trailer is included on the disc. ...is taking this week off due to a busy schedule which included a pair of movie-going trips to Los Angeles over the weekend. It will return next week! Last weekend's giant link roundup may be found here. The second film on tonight's double bill in UCLA's Exile Noir series was HOLLOW TRIUMPH (1948), which is also known by an alternate reissue title, THE SCAR. 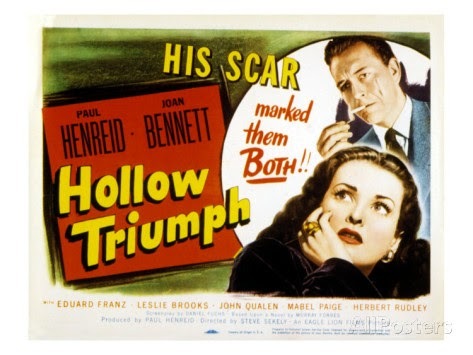 HOLLOW TRIUMPH was produced by star Paul Henreid and directed by Hungarian-born Steve Sekely. 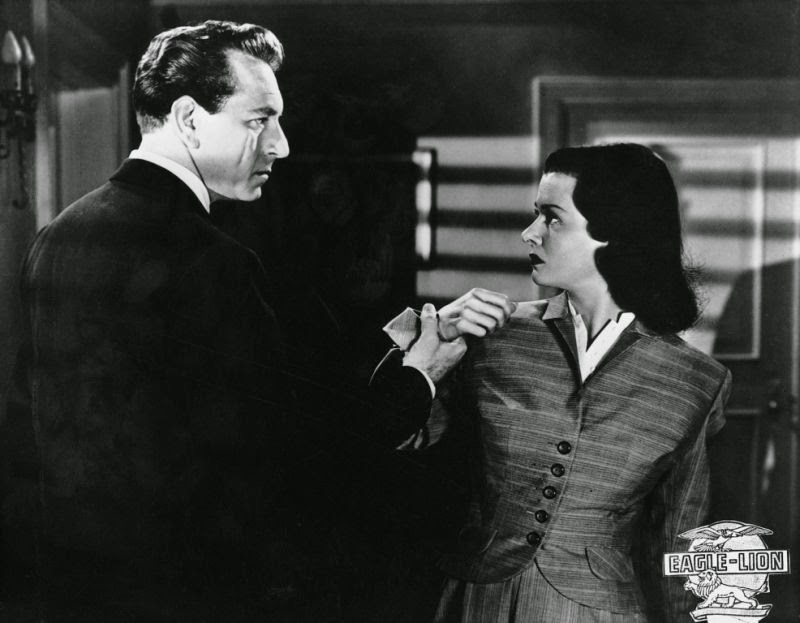 The excellent screenplay was by Daniel Fuchs, whose next film was the noir classic CRISS CROSS (1949). The script was based on a novel by Murray Forbes. The biggest round of applause during the opening credits went to cinematographer John Alton, who created another black and white beauty with HOLLOW TRIUMPH. I feel very fortunate to have seen it tonight in a wonderful 35mm print. HOLLOW TRIUMPH's additional attributes include Jack Webb in his very first screen role (as a skinny hit man! 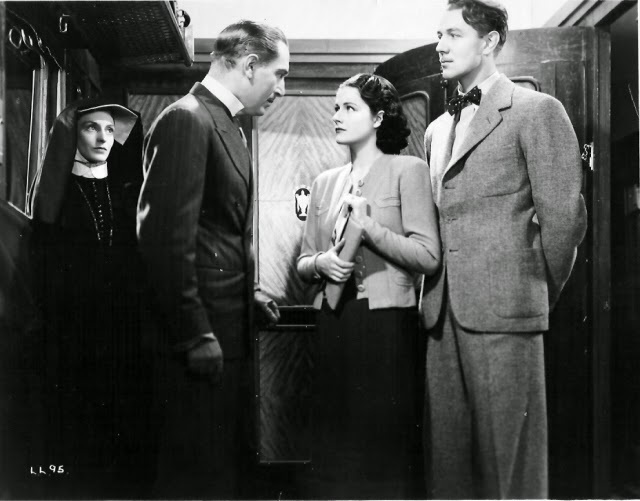 ), a chase on the Angels Flight Railway, and the always-amazing Joan Bennett. What more could a noir fan ask?! This 83-minute film was fun from start to finish. Henreid plays ex-con John Muller, whose plot to rob the gambling joint run by a bigtime mobster (Thomas Browne Henry) runs into trouble. He gets away with some cash but it's clear he's as good as dead unless he comes up with a really good plan to hide. Muller flees the state and heads west to California, where he takes a boring job under an assumed name. And then one day Muller learns there's a psychiatrist, Victor Bartok, working in the same area who's a dead ringer, other than a scar on his cheek. Muller had once started studying to be a doctor and concocts a plan to bump off the doctor and take his place. Will anyone notice the change, such as the doctor's beautiful secretary Evelyn (Bennett), who is also his lover? Muller takes even more of a risk getting to know Evelyn as himself, in order to pump her for information on Bartok; she thus knows there's a set of lookalikes out there. Despite her relationship with her boss, Evelyn falls for Muller, but Muller is determined to carry out his plan and tells Evelyn he's ending their romance and leaving for Paris. This film was terrific fun, building to a pair of wonderfully ironic twists. This is great noir, from the cast to Alton's black and white cinematography to the L.A. locations to the clever script. 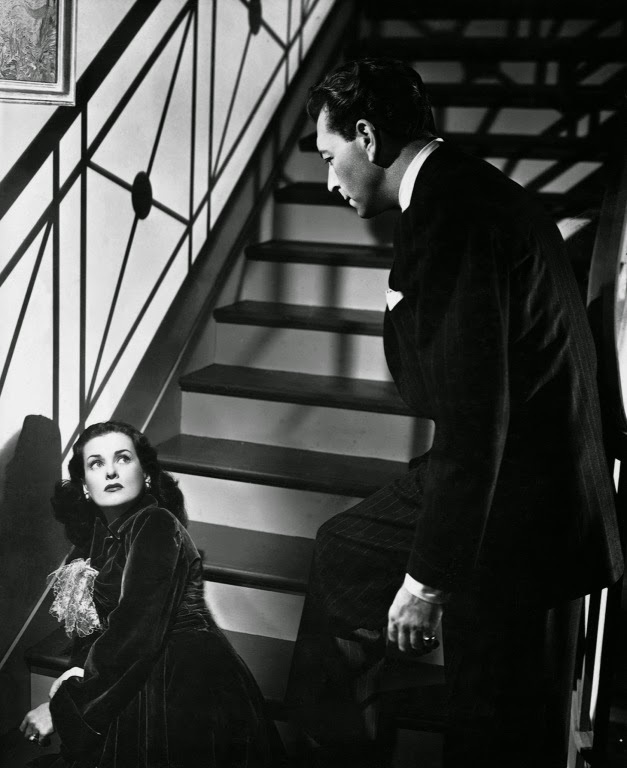 Every film I see cements my love for Joan Bennett. What a terrific blend of intelligence and stunning beauty. The only thing that might raise a question about the film is why such a smart and attractive woman in that era isn't married, but is willing instead to settle for an affair with her boss. Incidentally, it's interesting that she looked more worn out just a year later in THE RECKLESS MOMENT (1949) -- perhaps they scaled back the makeup for that role as a worried suburban mother? I don't have strong feelings about Henreid one way or the other but he does a great job in the role. He seems to have been a smart, business-savvy man, who developed an extensive directing career. Leslie Brooks (BLONDE ICE) has a small but key role. The cast also includes Eduard Franz, Herbert Rudley, John Qualen, Mabel Paige, George Chandler, Henry Brandon, and Norma Varden. HOLLOW TRIUMPH is available on DVD from VCI under its title THE SCAR; it's a double feature disc paired with THE LIMPING MAN (1953) with Lloyd Bridges. It's also on VHS and Amazon Instant Video. Previous reviews in the Exile Noir series: JEALOUSY (1945), BLUEBEARD (1944), and CITY THAT NEVER SLEEPS (1953). 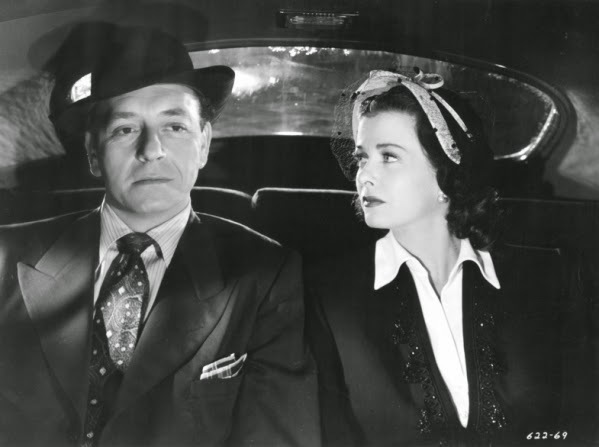 May 2017 Update: I had the chance to see this film again at the Arthur Lyons Film Noir Festival, with the screening followed by an interview with Paul Henreid's daughter Monika. This post also includes a review of a new Blu-ray edition of the film from Kino Lorber. UCLA's Exile Noir series came to a conclusion this evening with a very enjoyable double bill, CITY THAT NEVER SLEEPS (1953) and HOLLOW TRIUMPH (1948). 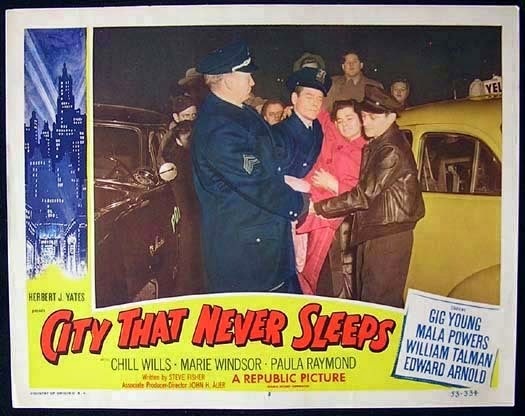 CITY THAT NEVER SLEEPS was directed by the Hungarian-born John H. Auer and written by Steve Fisher, the writer behind the original novels or screenplays of noir classics such as I WAKE UP SCREAMING (1941), THE HUNTED (1948), and ROADBLOCK (1951). Fisher's script has some terrific dialogue which tonight's audience really appreciated. With its introductory narration and "up all night" theme, the movie echoes THE NAKED CITY (1948) of half a decade earlier. Whereas THE NAKED CITY was filmed in New York, CITY THAT NEVER SLEEPS is set in Chicago. CITY THAT NEVER SLEEPS melds police procedural with film noir, and it also has a subtle mystical theme to differentiate it. Johnny Kelly (Gig Young) became a cop to please his dad, police detective John Kelly Sr. (Otto Hulett). Johnny is seriously considering ditching both the job and his pretty wife Kathy (Paula Raymond) and running off to California with a nightclub stripper, Sally (Mala Powers). He might even accept a bribe from a powerful attorney (Edward Arnold) in order to finance his escape from the Windy City. The film follows Johnny through an eventful single night on the beat which he experiences with a substitute partner (Chill Wills) while wrestling with his personal decisions. 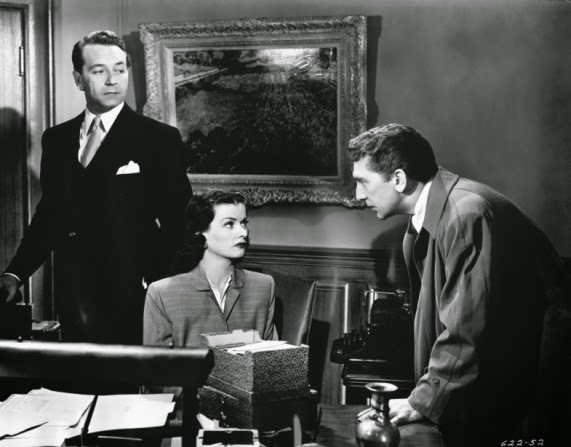 Marie Windsor plays the attorney's trophy wife, Lydia, and William Talman plays a former pickpocket and magician who intends to blackmail the attorney. This was a banner year for Talman playing villains, as he terrified audiences in THE HITCH-HIKER (1953) that same year. Talman gets my vote as one of the best noir bad guys ever; ARMORED CAR ROBBERY (1950) is another great example. Talman is great in this one, whether he's brazening his way out of a building he broke into or intently watching a "mechanical man" in a window trying to decide whether or not the man is real and witnessed a murder -- a great plot device. The movie starts out on the slow side; a scene with Johnny being nagged by his unseen mother-in-law is more silly than convincing, and Johnny seems more like a whiner than anything else. For starters, part of his problem is that his wife Kathy makes more money than he does. Sally's more than a bit of a shrew so it's hard to really understand the attraction. The grass is always greener, or so he thinks. The film picks up speed as it moves forward and all the elements in the story begin to snowball together. Marie Windsor's Lydia starts out lovey-dovey with her husband, but since she's Marie Windsor you just know that's not going to last! Nonetheless, I have to say there's one plot twist with her I didn't see coming, and it made the film all the better. The movie ends up being quite enjoyable and satisfying, and I was also pleased that I had figured out a story angle regarding Chill Wills early on. His character makes the movie a little different from the average noir. One of the movie's best attributes is terrific location filming in Chicago by John L. Russell. The shadows and rising steam in the streets are simply terrific. CITY THAT NEVER SLEEPS runs 90 minutes. The cast also includes Wally Cassell, Ron Hagerthy, James Andelin, and Tom Poston, in one of his earliest screen roles. 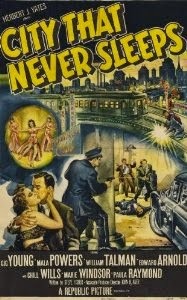 CITY THAT NEVER SLEEPS is available on DVD and Blu-ray from Olive Films. 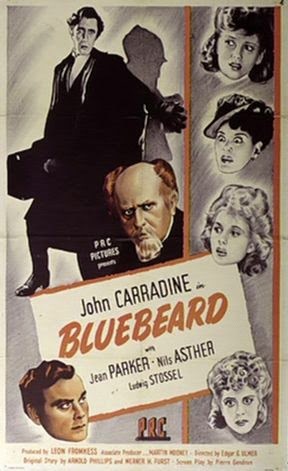 Previous reviews in the Exile Noir series: JEALOUSY (1945) and BLUEBEARD (1944). RATON PASS (1951), one of several Westerns released this month by the Warner Archive, is the kind of movie that's so interesting, you wonder why you'd never heard of it before. It's an engrossing film with a deep cast and a marvelous score by Max Steiner. This saga of a New Mexico range war has distant echoes of Rod Cameron's SHORT GRASS (1950), blended with the feel of a "Western noir" like BLOOD ON THE MOON (1948) or PURSUED (1947). The movie starts in fine style with Steiner's Latin-flavored theme music. 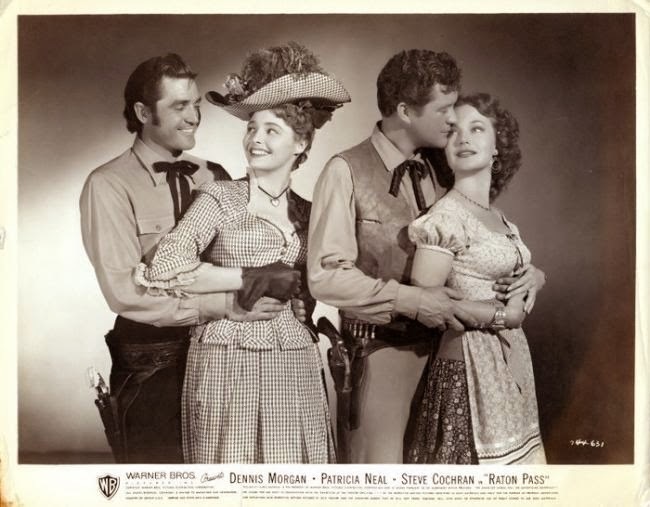 A stagecoach pulls into a small New Mexico town with adventuress Ann (Patricia Neal) and gunslinger Cy (Steve Cochran). 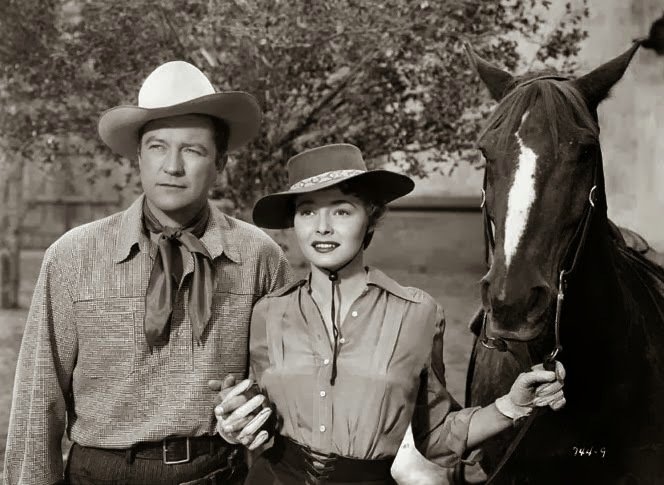 Initially intrigued by the handsome but dangerous Cy, Ann sees wealthy rancher Marc Challon (Dennis Morgan) on the street and marries him in short order, to the dismay of Lena (Dorothy Hart), who has long loved Marc from afar. The phrase "marry in haste, repent at leisure" is experienced by both Marc and Ann. The ambitious Ann is frustrated that her attempts to work on ranch improvements aren't desired by her husband or his feisty father, Pierre (Basil Ruysdael). She quickly turns her sights on banker Prentice (Scott Forbes) and launches a plot to leave Marc for Prentice and have Prentice buy her the ranch outright. Ann's scheming, when all is said and done, has the effect of unleashing a full-scale range war; she calls in Cy to act as her enforcer, while Marc forms a tentative alliance with his family's longtime enemy Jim (Louis Jean Heydt), who also happens to be Lena's uncle. RATON PASS is a fairly tough, gritty Western for its day, with characters dropping like flies during a brutal extended battle which takes up nearly half the film. It's also quite entertaining, with colorful characters and the action accompanied by Steiner's really fine score. Neal and Cochran play characters about as vile as can be. Neal's Ann made me think a bit of Jane Seymour in the much later EAST OF EDEN (1981), initially butter couldn't melt in her mouth sweetness, but after she hooks a rich land owner and shows her true colors, look out. She also learns the hard way that in relying on Cy to do her dirty work, she may also become his victim. 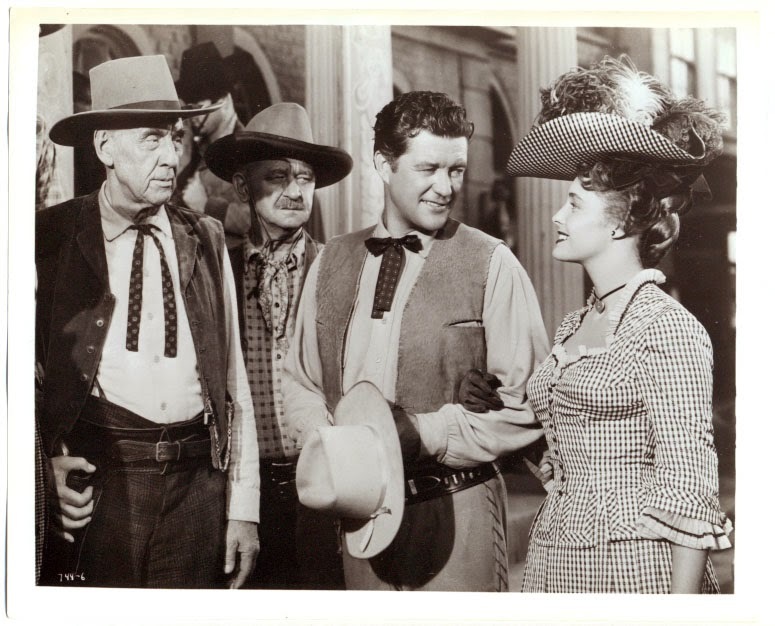 Having enjoyed Dennis Morgan in the Warner Bros. Western CHEYENNE (1947), I liked him in this also. 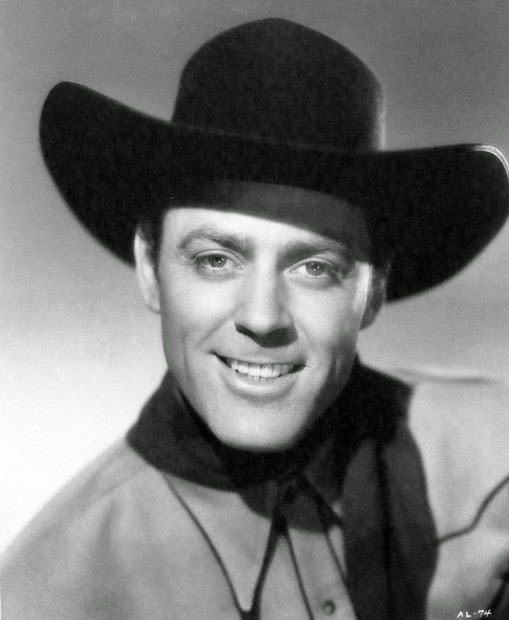 Morgan was a versatile leading man who is effective as a tough Western hero; the film also worked in a plausible chance for him to sing, at his wedding reception. I think this might have been the largest role I've ever seen Basil Ruysdael play, and he makes the most of it as the big, tough rancher who hasn't slowed much with advancing age; a scene early on where he casually takes down Cochran is a thing of beauty. 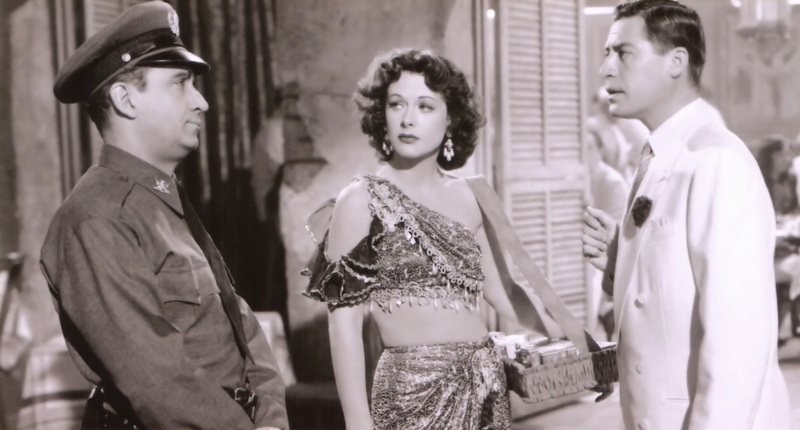 I was also happy to find Louis Jean Heydt in such a large role as I like him a great deal. (I still wonder if he and James Millican were ever seen in the same room at the same time...) Roland Winters and James Burke fill out the cast. The New Mexico locations are beautifully shot by Wilfred Cline. The movie was directed by Edwin L. Marin. The screenplay of this 84-minute film by James Webb and Thomas Blackburn was based on Blackburn's novel. 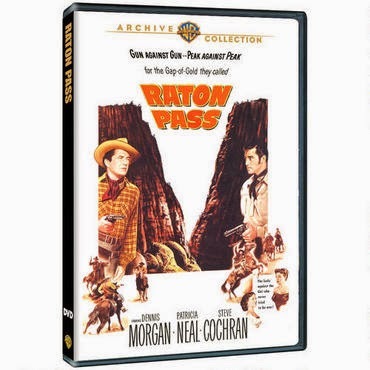 RATON PASS is the kind of lesser-known but worthy film I'm so glad has become available thanks to the Warner Archive. The DVD is a fine print. There are no extras. Allan Lane was a busy working actor for over 36 years, including voicing the title character of a popular TV series, yet relatively little was known about the man behind MISTER ED, the magical talking horse. That's now changed thanks to the very fine detective work done by Linda Alexander for her new book I AM MISTER ED...ALLAN "ROCKY" LANE REVEALED. I have fond memories of watching MISTER ED reruns as a young child, and in recent years I've enjoyed Lane in a variety of programmers such as MAID'S NIGHT OUT (1938), TWELVE CROWDED HOURS (1939), and CONSPIRACY (1939). 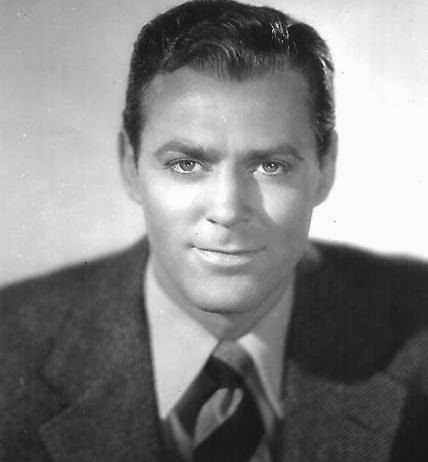 I was thus quite interested to learn more about him thanks to author Alexander, having previously enjoyed her books A MAVERICK LIFE: THE JACK KELLY STORY and RELUCTANT WITNESS: ROBERT TAYLOR, HOLLYWOOD, AND COMMUNISM. 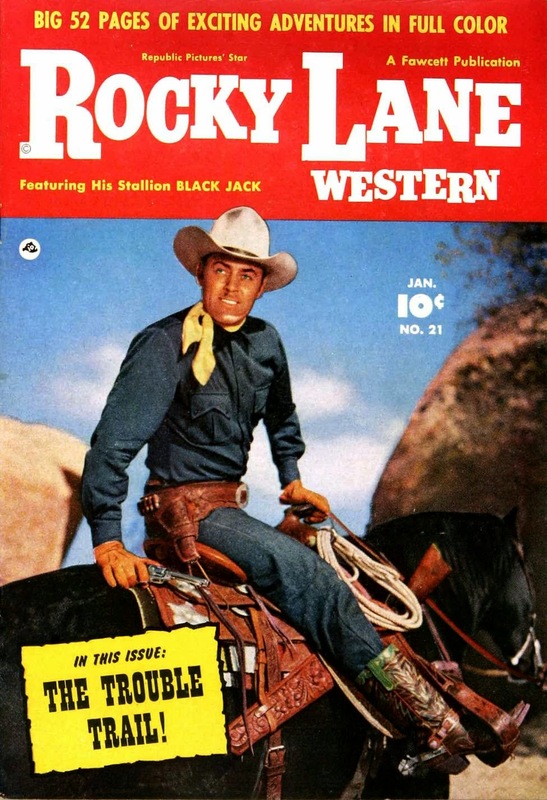 Allan Lane was talented enough to work steadily in the acting business for decades, including a run of several years as a cowboy star nicknamed "Rocky," yet his temperament was such that his marriages were brief and he was not always a popular coworker, considered a loner who had rigid expectations and didn't always engage easily in on-set interactions. At the same time, he was kind to children and beloved by close family and friends. He took care of his mother financially, and as "Uncle Harry" (his real name) he was idolized by nieces and nephews. Alexander digs deep into his past looking for answers and gathers evidence supporting the interesting possibility that Lane may have had a form of what is now known as Asperger's syndrome, which prevented him from always responding appropriately in social situations. It's a theory suggested by his niece, a specialist in autism spectrum disorders, in her forward. The book is of value not only for the information Alexander digs up on Lane's life and career but as an example of what it's possible for a determined biographer to learn decades later, when many possible sources are no longer alive. She was able to pull together enough information to paint a picture of Lane's rough childhood, holding down a job as early as seven years old. Based on what's known, it wouldn't be surprising if his difficult formative years without a consistent home also impacted his ability to form relationships. Alexander separates fact from fiction in his studio biographies; no, he didn't play football for Notre Dame, and no, his mother didn't sing light opera. The author was also able to put together Lane's marital history, much of which is missing from reference sources such as IMDb. One of the most intriguing stories is that in the early '30s he wed one Betty Miller; around the time she and Allan divorced in the mid '30s, she changed her name to Joan Perry. Actress Perry married Harry Cohn, the head of Columbia Pictures, in 1941 and her previous marital history was "deep sixed." I pulled out my copy of the 1967 biography KING COHN and was amused that Bob Thomas referred to Joan's previous brief marriage to a "photographer she had met while modeling." That "photographer" was actually the well-known Allan Lane, who took a sabbatical from films in the early '30s and operated a business, Allan Lane Inc. Photographic Illustrators, taking photos for ad campaigns. The book notes that Lane almost didn't play MISTER ED after the pilot, as he was considered "difficult" and too much of a loner. Other actors auditioned but ultimately it was felt none of them had the right voice, and Lane was satisfied to draw a regular paycheck without disclosing he was the voice behind the horse; indeed, he felt doing such voice work was somewhat beneath him, but gave it his professional all. This illuminating book will be very much enjoyed by all who are interested in Allan Lane or the workings of classic-era Hollywood and television. 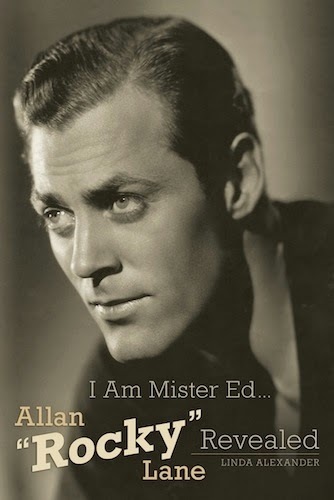 I AM MISTER ED...ALLAN "ROCKY" LANE REVEALED was published by Bear Manor Media. It's 315 illustrated pages including index, reference sources, and a list of Lane's credits. Sincere thanks to the author for providing a .PDF file of the book for my review. 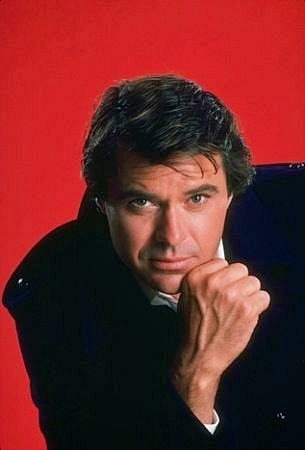 SPENSER FOR HIRE was a show I missed watching during its 1985-88 run on ABC, but the concept of a Robert Urich P.I. show filmed on location in Boston has long intrigued me. I'm happy to finally be catching up with this series thanks to the Warner Archive, which recently released Season 1 on DVD. The opening scenes of the pilot immediately caught my attention, as it features a shootout filmed in Boston's historic Granary Burying Ground, which I've visited on multiple occasions. The pilot as a whole did a great job of capturing the Boston atmosphere as as I remember it from my trips, from historic sites to gray skies and slush on the ground. The series is based on books by Robert B. Parker, with Urich's Spenser a well-read former boxer, ex-cop, and current private detective. The cast is rounded out by Spenser's girlfriend Susan (Barbara Stock), his friendly nemesis Hawk (Avery Brooks), and Lt. Quirk (Richard Jaeckel) on the Boston PD. 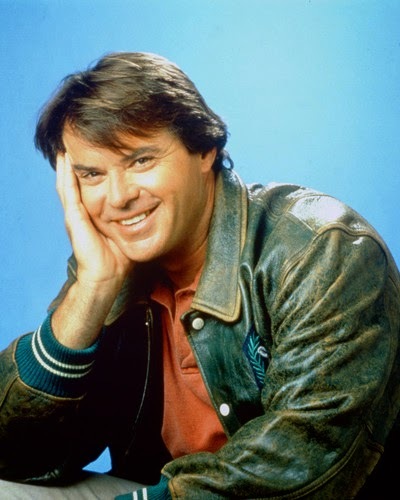 The series does capture a few of the bad things about the '80s: Bewildering plaid-on-plaid clothing combinations, big bubble hair on some women and unbecoming shag cuts on others, a few unsubtle guest stars who act like they're on DALLAS, and the incessant swelling of music in the spots where the show originally cut away to commercials. Clearing those aspects aside, mostly I liked the show a lot. There are also fun aspects to the '80s setting; for instance, it's hard to believe, but in the '80s characters still had to find pay phones when they needed to make a call in a hurry! It wasn't all that long ago, and yet so much has changed. 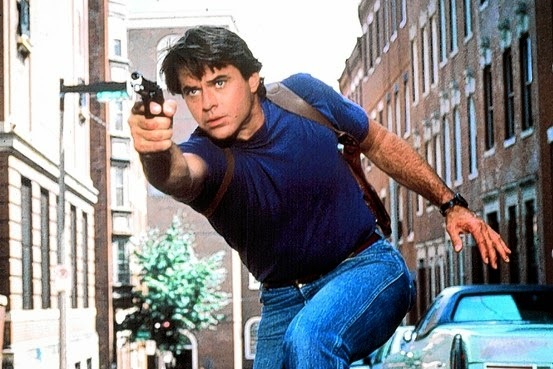 I also loved touches such as Spenser's poor Mustang being riddled with bullet holes throughout the pilot, and his home in an abandoned fire station is a genius idea. The first time he pulled his Mustang into the station I fell in love with it. 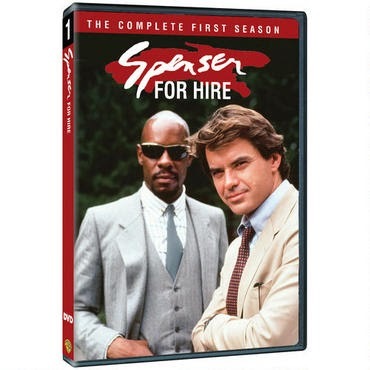 Spenser is a complex and interesting character who gradually reveals more of himself as he interacts with others; it's an intelligent show with thoughtful dialogue, and, as mentioned earlier, the locations are terrific. It's great to spend time with the likeable Bob Urich, an actor who left us far too soon. He was 55 when he died of cancer in 2002, leaving behind his wife, Heather Menzies (Louisa in THE SOUND OF MUSIC), and three children. Barbara Stock is a bit bland as Spenser's girlfriend Susan; it's hard to get a handle on what makes her tick and what she and Spenser have in common. On the other hand, Avery Brooks' mysterious Hawk is an intriguing character, stylish, unpredictable, and with an interesting way with words. Some of the dialogue involving Hawk's character is shocking to ears in 2014 -- the "n" word is used early on -- but the show's handling of racial issues is one of the things which makes it interesting, and Hawk is always the one who emerges with his dignity intact. With just three lead characters and a couple supporting actors, there does tend to be considerable focus on guest characters. This can be a negative if they're uninteresting or overplay. On the other hand, there are a number of notable guest stars who are fun to see. The third episode, "The Choice," about a pair of psychotic young killers, boasted not one, not two, but three future Oscar nominees: Patricia Clarkson (her very first screen role), Angela Bassett, and William H. Macy. Chuck Connors plays a mobster in the pilot, a role he would play again in Episode 4; there's a great scene in the pilot where he and Spenser cut a deal at a Celtics game. The series looks great, as though it's a first-run TV series. A nice plus is the network preview of each episode before the opening credits. Thanks to the Warner Archive for providing a review copy of this DVD collection. Warner Archive releases are MOD (manufactured on demand) and may be ordered at the Warner Archive website. Please note that the initial sets of this series sold at the Warner Archive site are traditionally replicated (pressed) rather than burned on demand. For the second weekend in a row I spent an enjoyable Friday evening in Westwood. Tonight started with dinner at 800 Degrees with Lindsay before walking over to UCLA for a pair of film noir titles. It's so nice being able to regularly enjoy movies with her! Tonight was another double bill in UCLA's Exile Noir series. The program started off with Douglas Sirk's SLEEP, MY LOVE (1948), starring Claudette Colbert, Robert Cummings, and Don Ameche, which I first reviewed in 2010. I had forgotten just how enjoyable SLEEP, MY LOVE was; I also think the film's more humorous moments were better brought out seeing the film with an audience. Cummings is very effective as the smart and witty hero who realizes there's something very fishy going on in Ameche and Colbert's marriage. Colbert is always good, and it's fun to see Ameche in an atypical role as the smarmy villain of the piece, who is attempting to "gaslight" his wife. Hazel Brooks and Keye Luke have fun supporting roles. SLEEP, MY LOVE is available on DVD or Blu-ray from Olive Films and is very much recommended. At intermission the UCLA Archive's Jan-Christopher Horak interviewed Arianne Ulmer Cipes, daughter of BLUEBEARD (1944) director Edgar G. Ulmer. Horak and Cipes had spoken at the TCM Classic Film Festival last spring, and it was very enjoyable hearing them talk about another movie from her father's career. Cipes is an engaging speaker who is very knowledgeable about her father's work. Early in the discussion Horak shared the good news that the interesting Ulmer film HER SISTER'S SECRET (1946), which was shown at this year's TCM Classic Film Festival, will be shown again at UCLA's 2015 Festival of Preservation. I was delighted to hear that news as I would enjoy a repeat viewing. My review of the TCM screening can be found here. Cipes shared memories of her father's long association with BLUEBEARD star John Carradine, who even lived in their home at one point, and reminisced about being the flower girl when Carradine married one of his BLUEBEARD costars, Sonia Sorel; David Carradine was the ring bearer. Cipes said she had promised her mother that she would make sure her father's films were found and preserved. PRC, the low-budget company which released some of Ulmer's '40s films, let its movies lapse into the public domain, and most eventually existed only in 16mm TV prints in the U.S. Eventually some prints of Ulmer films were tracked down in Europe, where they had remained after postwar screenings. 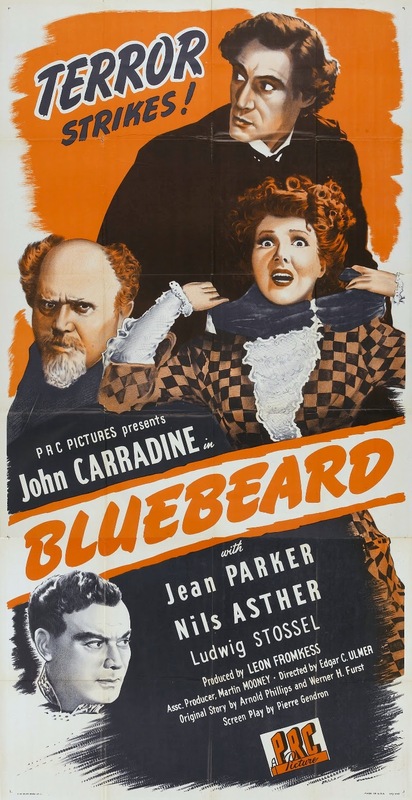 The 35mm BLUEBEARD print was located in Paris, and the opening credits are in French; with a French voice cast listed at the end of the credits, I thought for a minute we might be about to see a print dubbed in French! However, other than an English poster at the film's opening being translated into French, the film was in English, with a card reading "Fin" at the end. Sipes explained that although Jockey A. Feindel was the credited cinematographer, art director Eugen Schufftan had worked with her father as a cinematographer in Germany and was regularly on the BLUEBEARD set. He was not allowed to be a cinematographer on the film as he was not in the union, but he had a strong influence on the movie's look. Indeed, the cinematography is probably the film's most impressive aspect; shots such as the shadows of marionettes bobbing up and down on a wall are both creepy and memorable. The film is a short 70-minute look at a serial killer, tormented puppeteer Gaston Morel (Carradine), and the seamstress, Lucille (Jean Parker) who is drawn to him as the proverbial moth to the flame. Inspector Lefevre (Nils Asther) suspects Morel and asks Lucille's sister Francine (Teala Loring) to work with the police to uncover the truth. I enjoyed taking in the movie's style and was especially glad to see another credit in the careers of Parker (LITTLE WOMEN) and Loring (ALLOTMENT WIVES), but I found the film rather flat. The thrills and chills are somewhat muted; the killer's identity is known from the outset, and his victims seem curiously passive. That said, I was glad to have had the chance to see it in such a nice print, especially in the context of learning more about the director's career. The cast also included Ludwig Stossel, George Pembroke, Iris Adrian, and Henry Kolker. Last weekend at UCLA I enjoyed THE DARK MIRROR (1946) and JEALOUSY (1953) in the Exile Noir series. 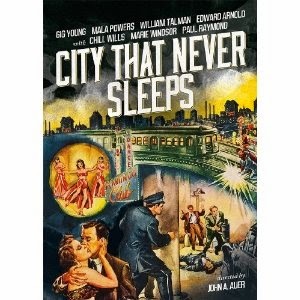 I also hope to attend closing night Sunday to see CITY THAT NEVER SLEEPS (1953) paired with HOLLOW TRIUMPH (1948).